Lady Gaga at the Bambi Awards 2011 at the Press Room, Rhein-Main-Hallen, Wiesbaden, Germany. Lady Gaga was one of the big winners at this years Bambi Awards in Germany. She dressed to impress wearing a a Spring 2011 Alexander McQueen gown complete with gold embroidered bodice and headpiece. Flew up two down! 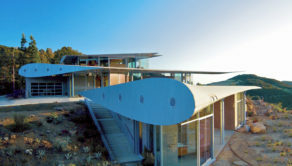 Pioneering architect builds house from Boeing 747!